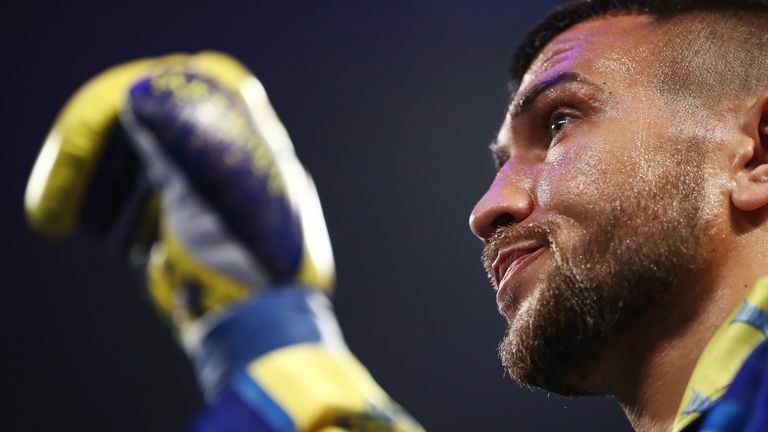 Most fighters are a product of their environment but Vasyl Lomachenko was always destined for bigger things, writes James Dielhenn. He is the incarnation of a successful experiment dreamt up before he was even born. Peek behind the Iron Curtain and you will find fighters whose backgrounds have shaped them, built them into what they have become. Gennady Golovkin, the Klitschko brothers and a slew of past and present Russian champions have a meanness and a stern disposition that their eastern Europe upbringings instilled. That manifests itself in the ring. 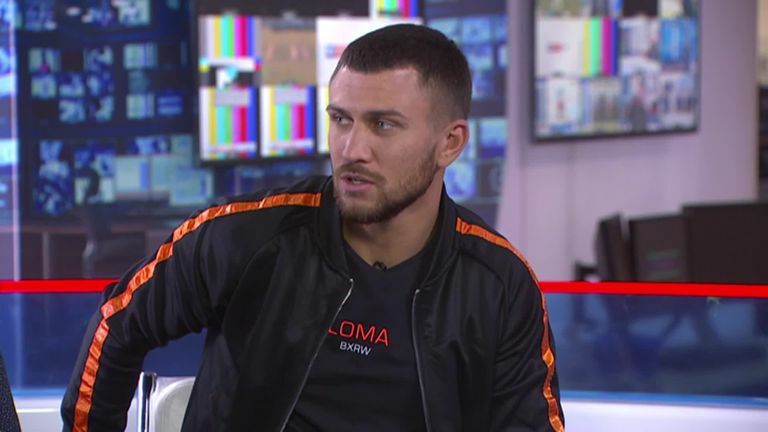 "I was born with gloves," Lomachenko tells Sky Sports but, actually, his birth was just the next stage of a science project masterminded by his father years earlier. Born on the beaches of the Black Sea where ancient mariners believed that savage tribes lurked, Lomachenko's background and introduction to boxing was different to his post-Soviet peers. The sea port of Bilhorod-Dnistrovsky in Ukraine, where he was born, is a far cry from the concrete jungles of Kiev or Karaganda. It is a "two-and-a-half thousand-year-old town", Lomachenko says, and it is mentioned in Greek mythology. It has one of the largest fortresses in the region so perhaps its most famous son's watertight defence was inevitable. "We have a lot of boxers, a lot of sportsman in our small town," he says but Lomachenko did not learn to throw punches like his countrymen, the Klitschkos, who were hardened by traditional methods in Ukraine's capital. Lomachenko did not need to fight to survive. His mother was, and still is, a gymnast and martial artist. His sister and his wife both practise acrobatics. His father Anatoly boxed as an amateur but became a PE teacher and the Dr. Frankenstein-like character known as 'Papachenko' who dreamed of his unborn son becoming one of the greatest boxers ever. Anatoly's thinking was ahead of its time and far beyond the confines of the schoolyard, or the widely accepted techniques used by boxing trainers with generations of experience. Lomachenko first wore boxing gloves three days after being born, according to the official version of events, but the stoic Anatoly nods when asked if a route had already been mapped out towards world championships. He remembers little else from his childhood except boxing practice, when asked as the 31-year-old wizard that he has become. "In the summers I sold ice creams and newspapers," but he has never needed a proper job. Little Lomachenko was encouraged by his forward-thinking parents to play ice hockey, basketball and ride horses. There is the now-infamous (and true) anecdote that Lomachenko was banned from boxing for four years and thrust into dance classes by his father who wanted to improve his footwork, and test his commitment to the sweet science. 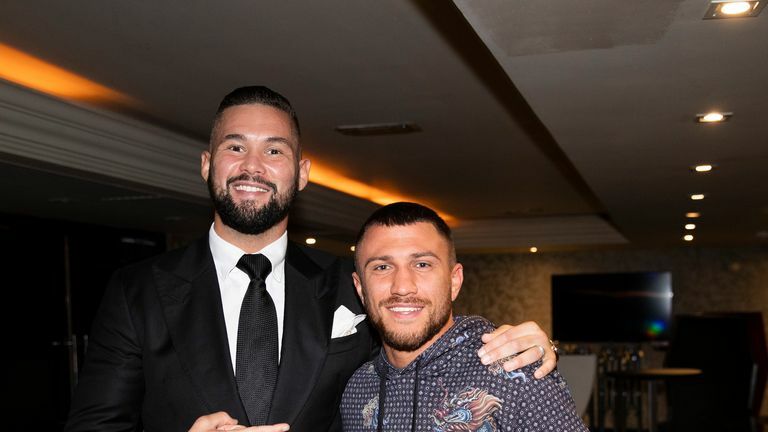 The untold spin-off story is that Lomachenko hated those years, and is a bit embarrassed to now be associated with formal, traditional dance practice. He is blunt when remembering those classes. Does he ever dance for old times' sake? Never, it is made clear. Anatoly is unapologetic and his son now possesses feet faster than his opponents' hands. "When I came in the boxing gym the first thing my father taught me was how to stay on my feet, and move on my feet. After he showed me how to punch," Lomachenko said. And when the punching began, the Lomachenko experiment went into overdrive. Eleven years ago he won an Olympic gold in Beijing at featherweight, then stepped up a division and took the top prize at London 2012 too. He won gold in each division at the amateur World Championships, too. Anatoly coached the team. Lomachenko and his partner in crime, Oleksandr Usyk, beat Sam Maxwell and Joe Joyce respectively on the same night when Ukraine's amateur team fought Britain's. Now brilliant professionals, Usyk defeated Tony Bellew last year and Lomachenko meets Anthony Crolla on Saturday morning at 3am, live on Sky Sports. A reported record of 396-1 means Lomachenko might be the greatest amateur boxer ever. The sole defeat pertains to Russia's Albert Selimov when he was 19-years-old. That was avenged twice, and once in the Olympics. Lomachenko gave all his beaten foes a Ukrainian flag to remember him by, but Selimov tossed it aside. The smiling, dancing Lomachenko has spite, as well as swagger. He now has tattoos of his Olympic achievements on each bicep but more noticeably has an image of his father created down the side of his body. Some admiration. Father and son combos are nothing new in boxing, consider the Eubanks or the Calzaghes, and each relationship is unique. "I didn't separate my father and my coach," Lomachenko explained. "Sometimes, of course, we have problems and arguments. But we will always stay as family." Has his mother always supported the cause? "Of course, yes. I love my family." Anatoly's hi-tech training regime was core to Lomachenko's success. The dancing was just the start. He now completes superhuman swimming sessions that involves holding his breath for several minutes. His mother taught him to juggle and do handstands - he now practises these things after conventional training, when he is physically and mentally tired, in order to improve his focus under stress. He has a specialised psychologist who gives him complex mathematical equations to complete when he is worn out. He plays chess. It is all designed to keep the brain as sharp as the body. They put microchips in his hand-wraps so that every punch is systematically logged and counted. These techniques might be seen inside Britain's Olympic centre today but, a generation ago in Ukraine, Anatoly's thinking was revolutionary. There is just one area where Lomachenko's training is a throwback to tried and trusted times - sparring. In many ways sparring is the last bastion of the old-school. Even trainers like Anatoly accept that their man must be put through the ringer to be adequately prepared. Lomachenko's team face a constant uphill battle to source suitable sparring partners because few can handle the requirements. He treats many sessions like a fight, they explain, and many employed helpers need to be helped out of the ring afterwards. Bigger men are routinely used, sometimes to test Lomachenko, and sometimes out of pure desperation to find a willing body. Today Lomachenko looks as close to perfection as exists inside the boxing ring yet his professional record is already flawed. He challenged for a world title in just his second fight but was bullied by the grisly veteran Orlando Salido, who didn't make weight and used that size advantage to bend the rules. Salido won via split decision. "Now I know that professional boxing is not amateur boxing. If your opponent fights dirty, you have to fight dirty too," Lomachenko reflected. He won the WBO featherweight title in his third fight against Gary Russell Jr, then became the fastest-ever two-weight champion, then the fastest-ever three-weight champion when he beat Jorge Linares. He unified WBO and WBA lightweight gold in his last fight. He has packed a lot into 13 pro fights. His boxing technique is to glide so gently that you wonder if he is punching his opponent or merely annoying them. Opponents have their willpower questioned by Lomachenko and don't find an answer. 'No Mas Chenko' was borne out of four consecutive opponents quitting between rounds - a trend so unheard of that it borders on the ridiculous. Miguel Marriaga, Jason Sosa, Nicholas Walters and Guillermo Rigondeaux chose to stop boxing, like Roberto Duran's notorious moment, during introspective 60-second periods when the Lomachenko tornado was obliged to stop terrorising them. How does he make men quit? "You should ask them," he shrugged. "Maybe they are not ready mentally. A lot of boxers are ready physically but not mentally. So, maybe, that's why." Those withdrawals robbed Lomachenko of the chance to complete a highlight reel knockout. "It doesn't matter," he continues. "A win is a win." Lomachenko is a fashionista. He wears shoes so outlandish that only dancing feet as talented as his could appropriately put them on. This isn't normal for Ukrainian men, it is explained, and you do chuckle at the thought of either Klitschko brother swanning around in tight trousers and a silk shirt. Lomachenko is a showman. His passions are clothes and fast cars, of which he owns several. He is comfortable in California, where he trains, but still lives full-time in his hometown in Ukraine. "He is the hardest man in boxing to beat and he is a perfectly balanced boxer, in offence and defence." "We already knew he had unrivalled skill but the way he got up off the floor and fought through a shoulder injury against a tremendous opponent in Jorge Linares proved his toughness matches his boxing ability." This is the pound-for-pound best fighter alive today - his fellow boxers are tripping over themselves to shower him with praise. This is a sport where credit isn't dealt out easily but Lomachenko has it in spades. He is humble about how he is recognised, saying: "It's too early to talk because I have a long road ahead." He really comes alive when he tries, but fails, to explain the sensational style of boxing that he uses. "My father can explain and teach only 50 per cent. But you need to be born with a chip [on your shoulder]. A Loma-chip." Anatoly, for the first time, utters a word of English. "It is a metric style. A universal style." His description doesn't really translate. Perhaps Lomachenko's style is impossible to explain, even in their mother tongue. Maybe we will never truly understand the genius. Vasyl Lomachenko defends the WBA and WBO lightweight titles against Anthony Crolla on Saturday morning at 3am, live on Sky Sports Main Event.